Watch to Learn – Videos to make you think ! ATTENTION STUDENTS: Please ask parent permission before viewing videos at home. Many food items that are produced in the United States are full of additives and chemicals. Unfortunately, Americans are eating lab-created and nutrient-stripped food that somehow got twisted around into being called healthy or normal. Because the food industry is a big business, many probably don’t know the facts about how their food is produced, and what ingredients in that food can do to our bodies. Standard American fare like hamburgers, hot dogs, fries, fast food, and frozen snacks are typically unhealthy and laden with saturated fat. Even the brands that are deemed “skinny, slim, for weight loss, etc” are not good choices in comparison to real food. This point makes perfect sense after watching the bounty of health and food docs that have paved way for the local, organic, raw, and slow food movements. 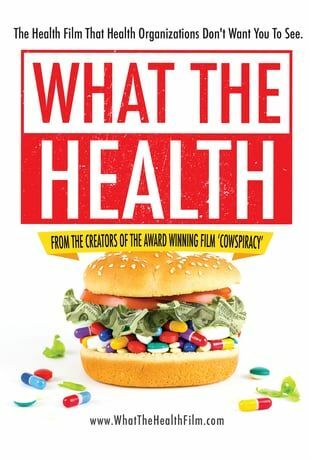 Here are 10 documentaries that will make you rethink everything you know about food and health. Most of these titles are available for instant streaming on Netflix. 1. Food,Inc. When this documentary debuted in 2009, it shocked viewers. Filmmaker Robert Kenner exposes the practices of global food production that is wrapped up in multinational corporate control, thus, placing profit over all else. We see the reality of large-scale food business, like poor health and safety conditions for animals and workers. This title is available for instant streaming on Netflix. 2. Forks Over KnivesRoger Ebert of the Chicago Sun-Times called this doc “ a film that can save your life,” and Dr. Oz said everyone needs to see it. The film examines the claim that most, if not all, of the degenerative diseases that afflict us can be controlled, or even reversed, by rejecting our present menu of animal-based and processed foods. This title is available for instant streaming on Netflix. 3. VegucatedThis documentary follows three meat-and-dairy-loving New Yorkers as they try to stick to a vegan diet for six weeks. After watching the film, try taking the “Vegucated” challenge yourself to better apply the documentary’s findings to your own healthy life. This title is available for instant streaming on Netflix. 4. Food Matters This film makes the claim that the over-industrialization of food production is making the nation sicker and sicker, and looks at the proliferation of chemicals added to food touted as “healthy.” The film looks at the relationship between the lack of nutrients that Americans consume and our rising health care costs. Providing a thorough argument, the film gives solutions as well for the problems it presents. This title is available for instant streaming on Netflix. 5. Supersize MeA well-known documentary by Morgan Spurlock, the film makes a simple argument that fast food makes us fat and unhealthy. To prove it, he takes a 30-day challenge where he can only eat food on the McDonalds menu, and he travels around the country to interview experts and regular Americans. If you’re looking for a kick to stop eating fast food, this doc is fantastic medicine. 6. Simply Raw: Reversing Diabetes in 30 DaysHolistic medical doctor Dr. Gabriel Cousens challenges six Americans suffering from diabetes to give up meat, dairy, sugar, alcohol, and other items and adopt an entirely organic, raw, vegan diet. The end goal is to cure their disease using raw plant foods. The documentary takes viewers on these peoples’ journeys and captures their medical, physical, and emotional changes on the diet plan. At the end, you’ll have realized the true impact that healthy eating can have on our bodies, not just for our appearance, but also to heal our ailments from the inside out. 7. IngredientsSimilar to Food, Inc., this documentary argues that food production needs to change. Filmmaker Robert Bates documents the rise of the local food movement, interviewing farmers and chefs who are passionate about producing local, fresh, healthy, and seasonal food. This film weighs industrial versus local food production, showing that local is the best option. 8. The Future of FoodThis acclaimed documentary has spurred anti-GMO grassroots movements. This must-see film has been screened and talked about around the globe. It details how genetically engineered practices, seed patenting and food corporatization, like that of Monsanto, is scarily changing our food while Americans have no idea. 9. Hungry for ChangeThis documentary looks at commercial food production and gives little-known truths about food and nutrition that are missing from the mainstream food discourse. The film also de-bunks diet and weight loss myths, as well as explains ways to stop bad habits and get healthy. 10. Fat, Sick and Nearly DeadThis inspiring documentary chronicles Joe Cross’s mission to regain his health. Starting at 100 pounds overweight with an autoimmune disease and a body full of steroids, Cross vows to only eat fruit and vegetable juices for 30 days. He interviews more than 500 Americans about food, then meets a 429-pound truck driver with the same medical condition. The two connect and the end result of a beautiful film that will inspire you to make changes in your own life. Here is another great list of videos to watch that make you think!